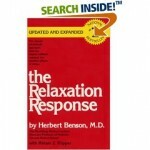 I recently finished Relaxation Response by Herbert Benson, M.D. In a nutshell, the relaxation response is the psychological and physiologic inverse of the fight-or-flight response, an instinctual reaction to a stressful situation. Whereas the fight-or-flight response increases one’s blood pressure, heart rate, rate of breathing, blood flow to the muscles, and metabolism, the relaxation response decreases heart rate, lowers metabolism, decreases the rate of breathing, and “bring[s] the body back into what is probably a healthier balance” (Benson 18). In my experience, the relaxation response has proven an effective antidote for headaches, muscle aches, and just general tension (both psychological and physiologic), all without the need for man-made chemicals or an expensive massage therapist. I highly recommend both the reading of and the practice of The Relaxation Response .